So you´re wanting to take a holiday and you are up for roughing it and to have an adventure. 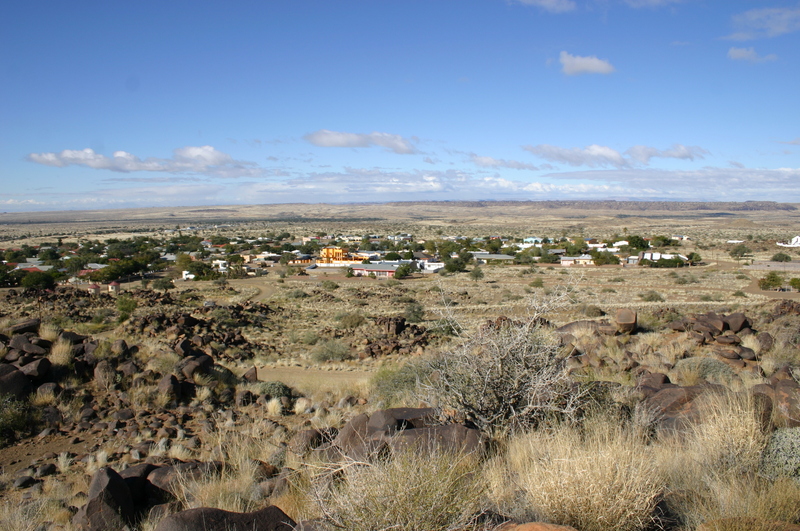 Why not try Keetmanshoop in Namibia. 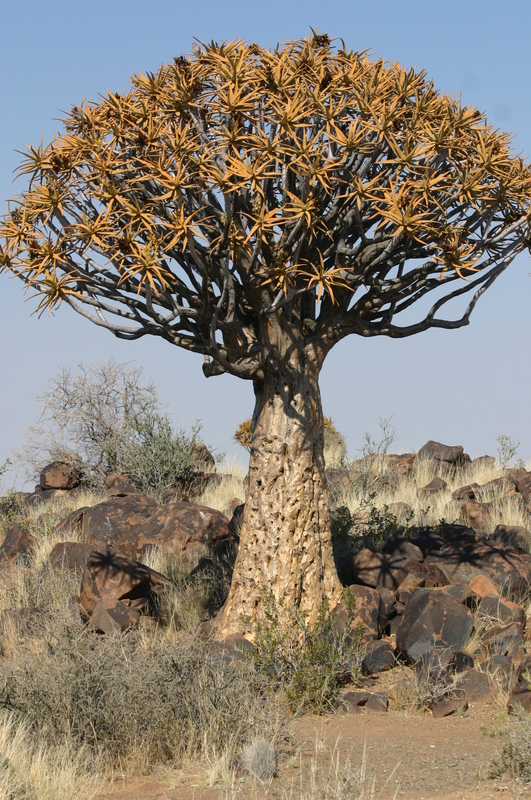 As you travel to keetmanshoop see the beauty of South Africa and southern Namibia. The drive takes roughly 13 hours from Cape Town, and this can be done in one straight stint, but if you want you can stop and stay overnight in a farm house or a BnB along the way. As you head further north notice the changes in the vegetation how the land slowly turns more and more yellow and the temperature rises. On our stop at the South African border with Namibia we were met by friendly people, who were extremely helpful. 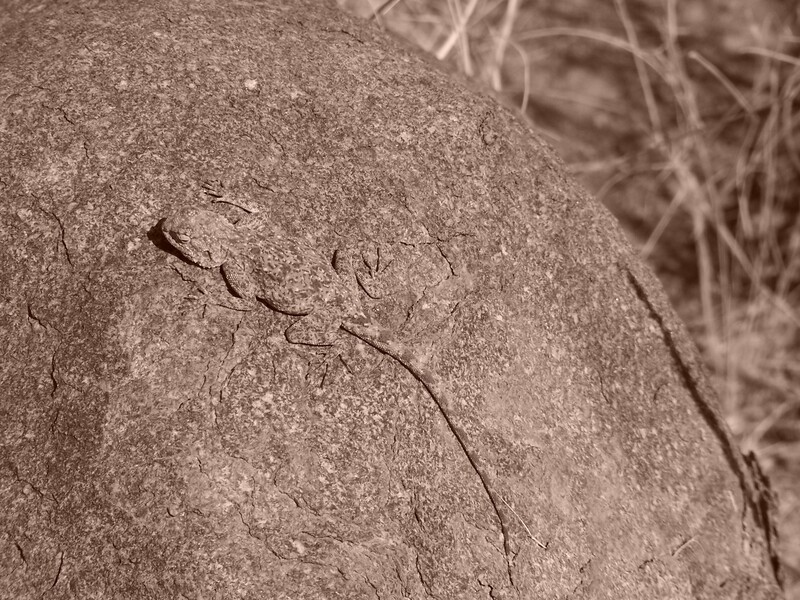 Once in Namibia you are greeted by mountains and interesting rock formations. 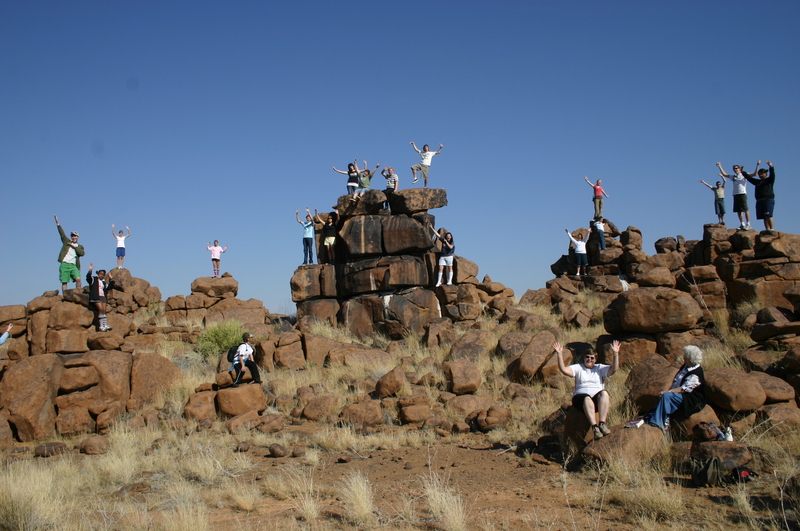 Keetmanshoop is not the perfect place to go for a holiday, but you can visit Giants playground, Cheetah park, and you are also able to work around the town to learn about Keetmanshoops history. The Giant Playground is a place where there are huge rocks that are shaped in squares and they make amazing formations, that are easy to climb and you are able to go up and have a picnic and just relax in the beauty of nature. If you are into beautiful big cat´s then you have to go to the cheetah park. 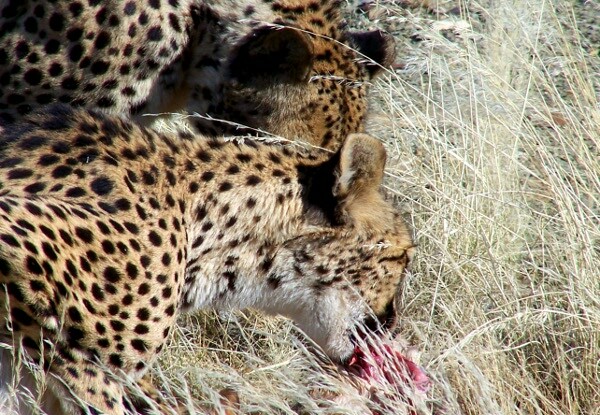 The Cheetah Park, is amazing you are able to drive in the park with the cheetahs and you are able to photograph then in there habitat and there is nothing between you and them, you are able to witness them feeding, and to just sit in your car as they are a meter away from you. 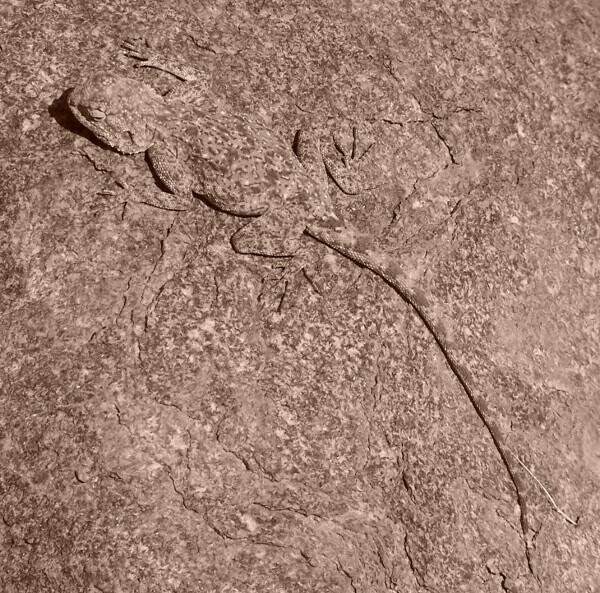 Before you enter into the park you are also able to see a few other animals such as, meercats. You will also want to see the quiver trees, and there is a gorgeous park where you are able to take in their beauty and view wildlife. You should also walk around that town just to get the feel of thing and to see all the historical sights. 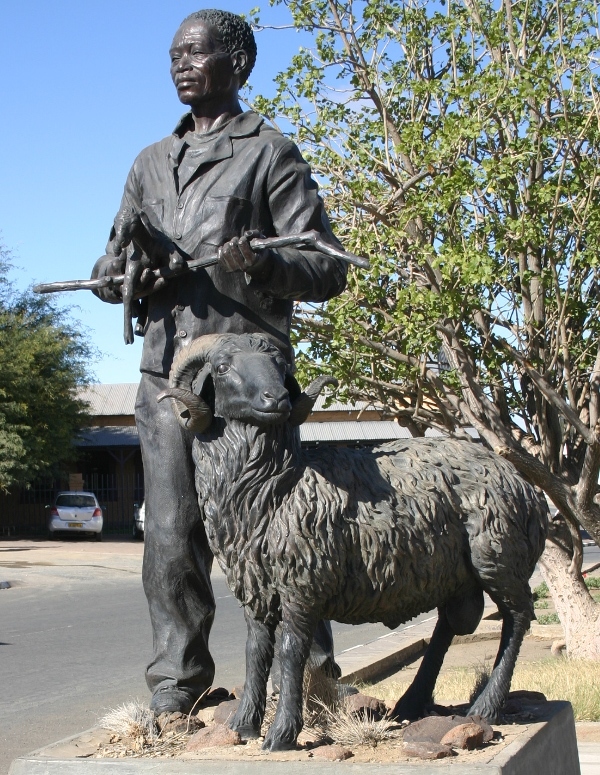 Spot the statue of a Nama sheperd with a lamb in his hands and a fully grown karakal. 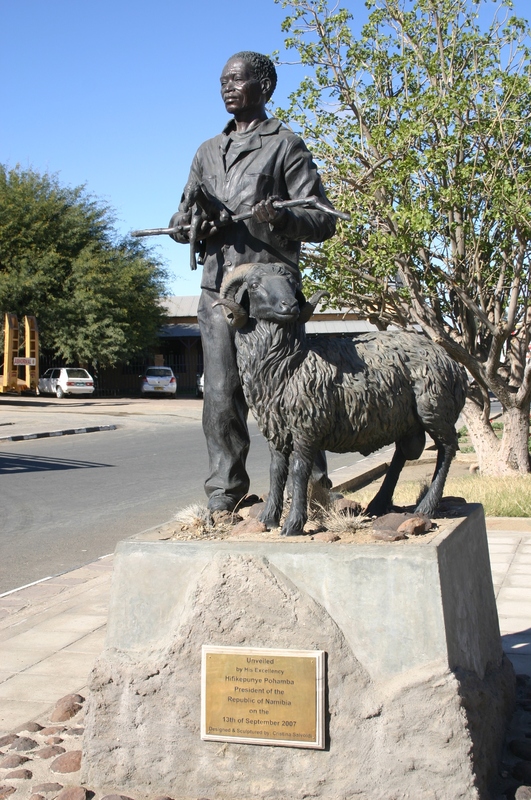 Designed by Christina Salvodi, the karakal statue was unveiled on the 13th September 2007 (during celebrations of the centenary of the karakul pelt industry in Namibia) by Dr Nickey Iyambo, Minister of Agriculture, Water and Forestry, on behalf of President Hifikepunye Pohamba. From Keetmanshoop you should go and visit the Orange River on your way back. The Orange River has an absolutely amazing setting with the water and the huge rocks, there are also the most amazing sun sets and even better sunrises. One of the best places to stay would have to be in a chalet at the Amaniz Trails. You are also able to rent a tent and the tent is already set up for you when you arrive and you don´t have to take it down so it is much less stress for you as the camper. You have access to hot showers and clean bathrooms. There is a kitchen so that you can cater for yourself, as well as a braai place. 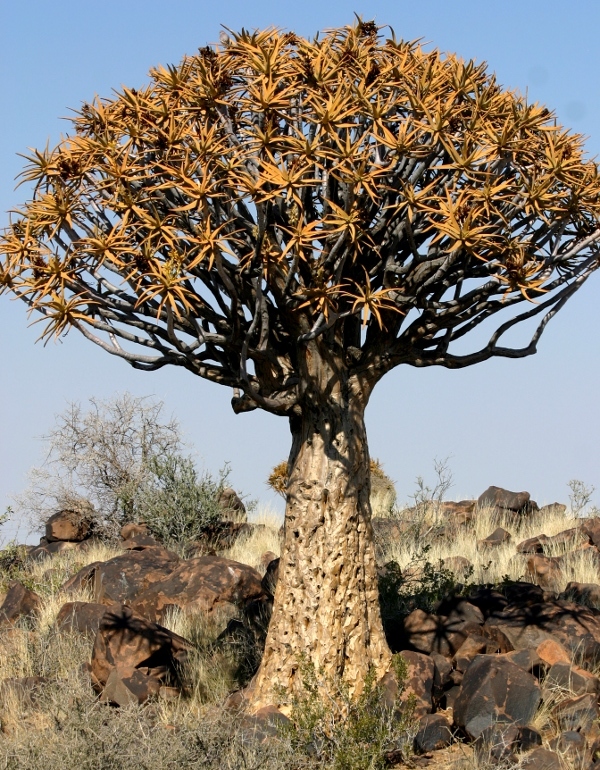 Depending on where you are you might even have access to South African cellphone networks. Take in the beauty and the stars. You are also able to go on a canoe trip and you are able to choose from one that is for a few days, or the one day trip, or a 4 hour trip. You will be driven to the starting point and then you canoe down since it would take a lot longer if you were to go upstream. In the four hour trip you get to go though 3 small rapids and there is a stop when you are half way where you will be given a cooldrink and chips, you will also be taken on the trip by two or more guys who are the pro´s and they are there to helps if it is needed and they give you direction and help to make the trip lots of fun. Photos and writeup by Mandy Rothquel [edited by South Africa Travel Online].